This tasty number came to us from the Vegetarian Menu Mailer ala the Dinner Diva. I love the simplicity (and affordability) of the recipes offered by the Dinner Diva. We got an entire 12 weeks of dinner recipes for under $10 and although they aren’t all vegan, the majority of them can easily be veganized (which we had to do to this one and provide for you below). Tonight we tried the Big and Busy Broccoli Soup and it was not only insanely easy to make but also insanely delicious. 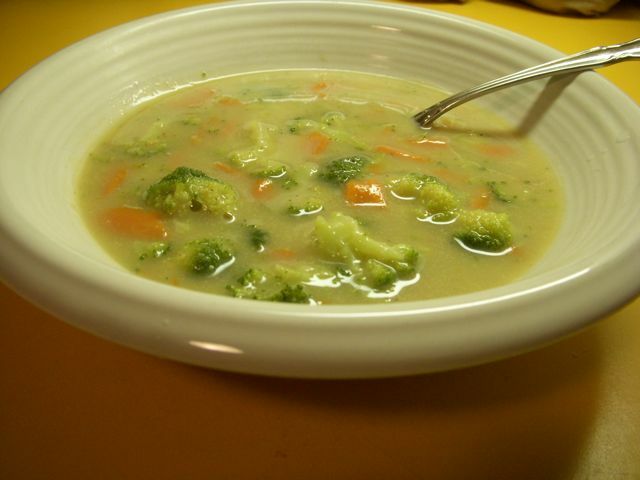 In a saucepan over medium high heat, place the broccoli, carrot, salt, pepper and vegetable broth to a boil, then reduce the heat enough to keep it at a simmer. Cover and cook for 6-8 minutes or until the broccoli is fork tender. Mix the flour and water in a small bowl and whisk until the flour is totally dissolved. (We put ours in an old Earth Balance container and shook the ever lovin’ life out of it). Pour this gradually into the broccoli mixture, stirring constantly while pouring. Heat to boiling over high heat, stirring constantly for about a minute and it should be nice and thick. Stir in the soy milk. Cook, stirring occasionally; you want it hot NOT boiling. As soon as it looks ready to boil, it’s done! We served this up with a nice leafy green salad and a baguette. This made enough for leftover lunchables. All we have to say is NOM. every time i hear the word broccoli, i think of the dana carvey skit on SNL. I just subscribed to your blog ’cause I am always finding such good, simple, yummy things here… Thanks!! hey woz, you’ve been tagged. now bring it, when you have the time of course. view my blog for details. thanks!